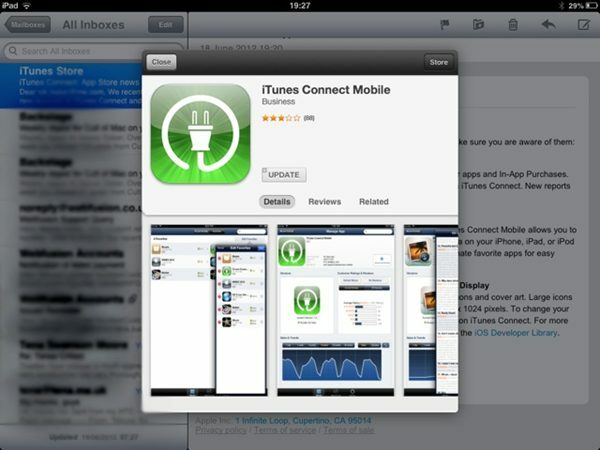 Mail in iOS 6 shows mini app previews when you click an App Store link. Traditionally, clicking on App Store links in iOS was a very jarring experience. Instead of being taken to an App Store preview page like you are on the desktop, you would be immediately thrown out of your current app, and shuffled over to the App Store. This problem seems to be alleviated with iOS 6, at least to some extent. In a screenshot tweeted to Cult Of Mac’s Alex Heath, Nikolai Baker shares that when you click on an App Store link in Mail, you are now presented with a mini App Store window, instead of being launched into the app itself. This is a welcome addition to iOS 6, and certainly streamlines the process of working with apps. This new feature is also present on the iPhone, and looks nearly identical to the iPad screenshot above. Unfortunately, as of now, no other apps seem to get this feature. In Safari, you are only presented with a dialog box asking for permission to open the link with the App Store. Other apps, such as Messages and Notes, pull you out of the current app just as before. While full, system-wide support for these previews would be a nice addition, what we have now is a step in the right direction, and hopefully we’ll see this come to other apps soon. Until then, we can only dream about a day when all our App Store links have mini previews.